Hello Ethryllites Everywhere! My Goodness, September Already! Ethryll have been having an exciting summer. Between the excitement of some super gigs such as the Sheffield Tramlines Festival and our behind the scenes work on our first album “Murmuration” we have been busy little bees. More on both of these later. Firstly we would like to tell you about some upcoming chances to see us live. Saturday 10th September 2016 – Victoria Hall Methodist Church, Norfolk Street, Sheffield. Ethryll will be performing this coming Saturday to help raise funds for the Maer Achol Shelter. This shelter provides help to street children in Dhaka, Bangladesh, and is an extremely worthy cause. We hope you can join us and dig deep to support their fantastic work. This event is an open mic night with a featured headlining band (that’s us this time). Knowing Doncaster’s lively and diverse open mic scene, you are in for a treat. Due to the nature of the event timings are a little fluid. Things kick off from 7pm, and we will be on at around 9-9.30 ish. We look forward to seeing any Doncaster Ethryllites who can make it along. It is with immense excitement that Ethryll will be playing on the Folk Train. For the uninitiated, the Folk Train is the 19.14 to Manchester Picadilly from Sheffield Station on the 4th Tuesday of every month. 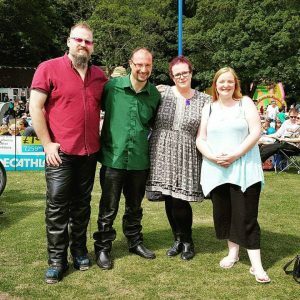 Each month a featured folk band entertains the passengers between Sheffield and Edale, where everyone decamps to the The Rambler Inn and the entertainment continues until everyone returns on the 21.29 train to Sheffield with the band still playing. Recently the Folk Train has been hugely popular, so much so that there is overspill into the second carriage. September’s main band is the Porch Lizards. Ethryll will be performing in the second carriage to make sure all the folkie passengers are suitably entertained. Please note that Ethryll will not be performing at the Rambler Inn. Doors at 7.30pm More information on other artists and timings to follow. The Royal Standard, 156 St Mary’s Road, Sheffield. This summer as been a fantastic time. One of the highlights has been the Sheffield Tramlines Festival. We were invited to perform on the “Bird Table Stage” in the “Folk Forest” in Endcliffe Park by the excellent Richard Masters of Bell Hagg Orkestar (or you may remember him from Poke if you were a 90’s student). Weather wise, there could not have been a more perfect day. We got to sing “Burning Blue” under an actual burning blue sky as picnic blankets and knotted hankied heads filled the park in front of the stage. The atmosphere was amazing, and it was great to see so many young folk fans enjoying the day. Thanks to everyone who came to support us. Here are a couple of pics from the day. 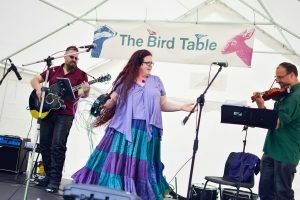 Ethryll playing the Bird Table Stage at Tramlines Folk Forest in July 2016. We also enjoyed a return to West Street Ale House (OMG the beer is sooooo good). Always a great place to play, and it was great to see so many friends there. We were up against the Olympics Opening Ceremony, but were very pleased (and slightly relieved) that we still got plenty of people in. The work on Murmuration continues. We are still not yet at a point where we can give a release date, but we are still aiming for it to happen in 2016 if we can. Eel Reel with it’s miriad tempo changes has presented some distinct challenges, but no laptops have been hefted through windows (yet).